Although Pugs sure don't look fierce and guard dog-like, they are very alert and will watch over whoever stands close to them. Because of their posture and their adorable and funny looks, people often think that Pugs are nothing but lazy lap dogs. Almost the opposite is true. Pugs are true companions, they will guard you with their lives. Although Pugs do not have the same size as Rottweilers or Sheperd, the often think they have. When they think you are in danger, they will do whatever they think is necessary to help you. Pugs are very people oriented. When you read the breed characterics of the Pug, you will notice that you will come across the words 'alert', 'true companions' and 'stubborn'. That is what the Pug is. The breed even has its own motto: "multum in parvo", which means "a lot in a little package". Pugs can be very stubborn, though. They can be trainable with quiet patience and understanding. Never yell and scream at your Pug or hit your Pug. Pugs learn best with positive reinforcement. and have a great willingness to please, but they do need positive encouragement. 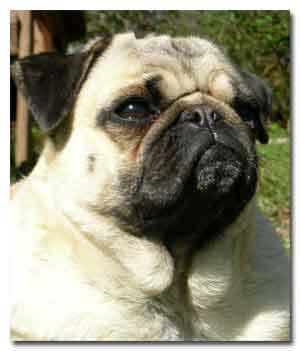 The Pug nosed dog breed requires regular exercise, and some P will walk for over an hour. In any case however, it is important to make sure they do not overheat, as their short noses sometimes do not cool them off enough. Many Pugs make a grunting nasal noise, which increases when they get excited or overheated. Pugs are shorthaired and they do not need a lot of brushing. They do shed a lot, no matter if it is summer or winter seazon, and brushing helps keep the hairs off your clothing. The nose wrinkle needs to be cleaned with a damp facecloth regularly. Pugs tend to get nose and ear infections very quickly. Because of that, also the ears need to be checked and cleaned regularly. Pug owners are a strange type of people. While most dog owners will see their dog as 'just a pet', Pug owners often see their beloved dog as their child. The Pug is one of the most written about dog breeds, you can also find a lot of Pug forums on the web. Because of the Pug character, a lot of celebrities own Pugs. Some of the most well known Pug owners are Billy Joel, Jessica Alba, Tori Spelling and Josephine Bonaparte (the wife of Napoleon Bonaparte). The Pug is one of the oldest dog breeds in the world. While Pugs do share a lot of the characteristics of the Bulldog, they are not related to this breed. Its origin lies in China, around 700 years B.C. In the 15th and 16th centuries, Pugs came to Holland, Germany, England, Spain, and Russia. Pugs first came to America shortly after the American Civil War. 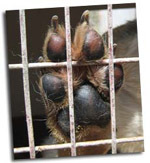 This article is written by Pugs.nl for Four Legged Friends.com. Visit Pugs.nl for more Pug information.